My name is Angela Dainton. I worked in the NHS for 5 years on graduating in 1995. 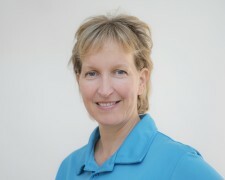 Since then I have worked in the Private Sector in Physiotherapy and Sports Injury Clinics. I worked in Australia for 5 years where I became proficient in treating a variety of Sports Injuries, working alongside Sports Physicians and Northern Territory Institute of Sports. I also worked alongside the Royal Flying Doctors. I have lectured and ran workshops for Nurses and Trainee Doctors. My specialties include Musculo-skeletal and Sports Medicine, Clinical Pilates, Acupuncture and the Management of Lymphoedema. My hobbies include cooking, swimming, tennis and golf. I have 2 children aged 16 and 13. I am commited to keeping up to date with all aspects of Physiotherapy. I am also a Pilates Instructor.